This is a continuation of a series for those of us who are wanting to make the leap from run of the mill hunter, to hunter extraordinaire. We'll be going through play that may seem old hat to experienced, "hard-core" hunters, but is beyond the grasp of the average WoW player. 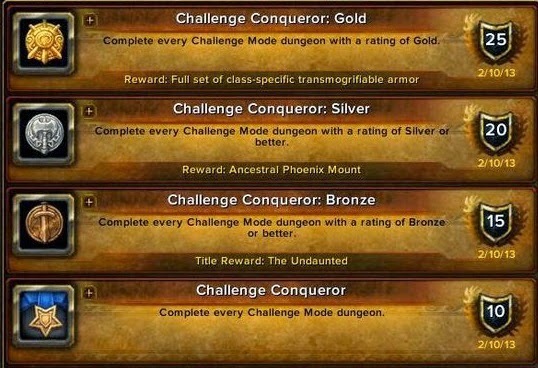 With the semi-recent announcement that challenge modes will be coming to a close when 6.0 is released, plus the announcement that we'll soon be able to get all skins of the mounts, and they'll be account-bound, I've been seeing more and more people asking to buy Challenge Mode runs. Whether you're selling challenge modes, or you just want to help out a friend, carrying a person who may or may not be contributing makes golds even harder than they already were. With a hunter in the challenge mode group, success will be nearly guaranteed. To start off, I should say that both the group I originally completed 9/9 golds with, as well as the group I've carried people with, utilized Blood DK tanks. They're particularly valuable because they have enough self sufficiency to finish off, or start groups of mobs while your healer is using their Amber. As for Healers, I've run with Priests and I've run with Druids. Both Shamans and Druids have great AoE heals that can help assist with large trash pulls. But it's important to remember that any healer class is capable of this, though some require more skill than others. We're just trying to get someone golds, we don't need to find the perfect comp for getting server best times. Challenge Mode dungeons are really where hunters shine in WoW right now. While hunters are still finding ways to make it happen, Blizzard has nerfed a lot of our extreme soloing abilities and raid pet tanking is nearly non-existent these days. In a challenge mode dungeon, we get to show off our entire arsenal, while at the same time doing amazing dps, and even making our teammates look better. Let's take a look at some of the rarely used abilities that will make a hunter shine. You'll want to have all of these abilities keybound (if you don't already), and easily accessible in a moment's notice. 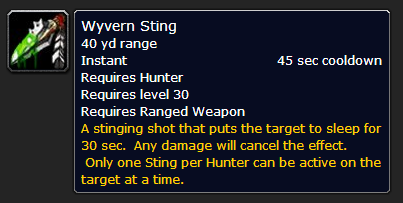 This is one that really doesn't come up in Raiding too often (though PvPers always have it ready to use). I remember the first time I did Thok, thinking I could help out when the Jailer enraged by tranq'ing him. But that just made my tanks upset because they wanted the extra vengeance. In Challenge Mode keeping mobs Tranq'ed will allow your tank to pull more mobs at a time, so you'll want to use it any chance you get. If you're not used to using it, an addon like JSHB or a custom Weak Aura can help you know when a mob is using an ability that can be Tranq'ed. Where in raiding threat control is basically no longer part of the game, in Challenge Modes you'll often see tanks struggling to keep all the adds under control. 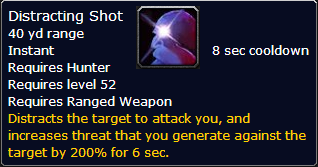 You're job as a hunter is to stay glued to your healer, and if any mobs start attacking them, hit them with distracting shot and kite them back into the loving arms of your tank. Learning to do this will save wipes. If you really want to show off, practice hitting a distracting shot, kite them to your tank, feign death and Disengage right back to the side of your healer; if you can pull that off without losing more than 2 GCDs worth of DPS, you get extra awesome points. Other than when fighting bosses, you're going to use Ice Trap on cooldown. If it can be used, use it. Having the mobs slowed will give your tank a chance to get ahead while you DPS them down. One of the problems with carrying someone through a challenge mode dungeon, is they might have absolutely no idea what they're doing. Gate of the Setting Sun is the only place where this is really mandatory (others it's generally better to keep Binding Shot), but being able to CC two mobs on the go can save a good chunk of time. Not having to rely on someone else and trust their CC'ing can save even more. This is by no means an exhaustive list of what you'll need to complete Challenge Modes. You'll also want to be proficient at Binding Shot and Counter Shot, Freezing Trap, and Snake Trap, not to mention using all of these abilities while performing your DPS rotation nearly flawlessly. I'm not trying to present this as a simple "use these three shots and you're golden" sort of guide. But with a little practice, and using the entire hunter toolkit, you'll be incredibly valuable-as valuable as a good tank or healer. Now that you've mastered using these abilities, the next step is looking good while you do it. This is really important, so take note. If you have an addon that is announcing things like interrupts, or tranq'ed mobs, or masters call, turn it off! Your goal is to make things easier for your teammates, it's not to fill the chat windows with announcements of all the great things you've done. In fact, it's even better if they don't know why they're magically so much better when you're around. All they'll realize is when you're not there, they fail miserably. This is the joy of being a hunter.